Set aside ½ cup of whole milk in case chowder is too thick. 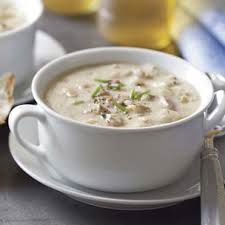 1.COOK in a large saucepan over medium heat onions and clams and chowder in butter stirring occasionally until done. In a large saucepan place potatoes and carrot, and a dash of salt in water and cook, stirring frequently, until potatoes and carrots are tender, drain and set aside. When fish and onion mixture is cooked add in potato mixture and stir. 2 To the mix add evaporated milk and clam water, salt and pepper to taste and reduce heat to medium-low; cook, stirring frequently, for 15 to 20 minutes or until creamy and slightly thick. If chowder is too thick add ½ cup whole milk and enjoy. 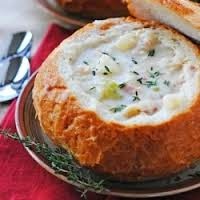 I like to serve my chowder is a bread bowl just to make it extra yummy.